Noise from the oscilloscope and probe is indistinguishable from the noise and ripple of the dc supply. Oscilloscopes often don’t have enough offset to shift dc rails onto the display. Low-impedance probes can load down a power rail – changing the way it performs. But high-impedance, high-attenuation probes tend to be noisy. The perfect probe would present high resistance to dc but 50 Ω for ac. Probes may not have sufficient bandwidth to see gigahertz noise that can affect high-speed drivers. The new TPR1000 and TPR4000 power rail probes address each of these concerns. The ultra-low noise contribution of the probes helps you measure the noise on your DUT – well below a millivolt. The probes offer up to 60-V offset, 1-V dynamic range and up to 4 GHz of bandwidth. Various solder-in tips offer reliable access to hard to reach, sensitive signals with optimal signal resolution at up to 4 GHz. For connecting to test points, SMA, MMCX, U.FL and square pins are included. 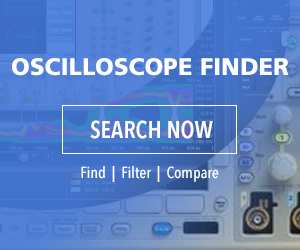 An optional handheld browser makes quick measurements up to 1 GHz. Available for order with shipments expected to begin in late March 2019, the 1-GHz TPR1000 and 4 GHz TPR4000 single-ended power rail probes with the TPR4KIT accessory kit are priced at $4,000 and $6,000 respectively.